LCK PropertiesNeed To Sell Your House Fast? We Buy Houses! "It was a very good experience, and it went quick." "Closing went smoothly and they pay for all the closing cost. Very Satisfactory"
"Very Good Experience and Handle very professionally." "Everything went Smoothly and as promised"
"I had a Great Experience, it was easy, everything was explaine to me and today I close" " I'm Very Happy!!" 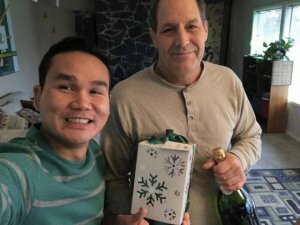 Seller survive an open heart surgery, got his property sold and is now taking his wife to travle the world! We're gald were able to help! "It was very quick, very precise, and very professional. Yep, everything you say you would do, you did"
Seller was extremely happy after a quick and easy closing we did! "It was time to sell.. everything went very smooth." It happen in 15 days! Wife passed away and the house is in bad shape. He found the letter we send him and gave us a call...We were able to buy the property "AS IS" and pay for all his closing cost! Here what seller gotta say about selling us his house. 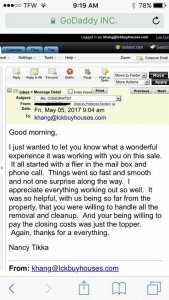 "Everything was done as promised..."
Email we got from the seller after closing, who lived far away from the property. "Things went so fast and smooth and not one suprise along the way"
LCK Properties did everything that we agree upon and promise!
" there was some issue with the property and hoops to jump through but they took care of everything. Everything work out really well"
Another Happy Seller!! We close 20 days earlier then he expected :). And He was able to stay there for an extra 30 days after closing so he can have time to move. We always looking to create a win-win for both parties.
" We got your information throught the mail and we contact ya. Everything went by very smooth. You did everything you said you'll do. We're very very happy with how everything went down and it was done." 2 week closing :) Took care of all their closing cost. Seller lived in a different state and were tired of being out of state landlord. With the help of their son Bill, setting up the showing we were able to purchase and close within 15 days. We also took care of all their closing cost and best part is seller were able to sign closing doc where they were with the help of Chicago Title. "Great experience, easy to work with, great communication and glad that I went with them to sell my house"
"Khang did everything he said he would..."
"All I had to do was fill out the paperwork and they took care of all the closing and fees." Seller wanted the monthly income and have some money to pay off his home. We were able to do an owner contract with him and create a win-win for everyone.
" It been nothing but a great experience! I'm happy as a clam and I'm ready to move to Montana and retired." "Very pleased with what was done...."